This weekend at Designer Con 2017, Martian Toys will be releasing the fourth colorway of Nicky Davis’ awesome Dead Bear vinyl figure featuring a killer pirate design by artist Jon-Paul Kaiser! 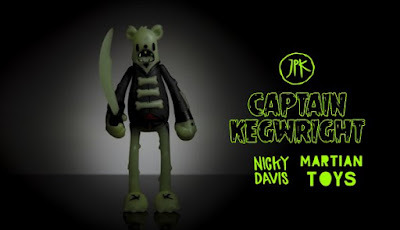 Captain Kegwright is the Dead Bear’s second artist edition colorway and boy does it look awesome! Not only does this DCon exclusive colorway glow in the dark, but it comes with a matching glow in the dark sword accessory! 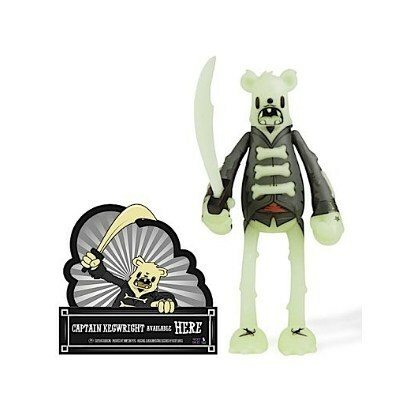 This zombie pirate bear stands 5.5” tall and goes on adventures that would put Black Beard, Captain Cook and even Captain Jack Sparrow to shame! Collectors can purchase the Designer Con 2017 Exclusive Captain Kegwright Dead Bear GID Vinyl Figure by Jon-Paul Kaiser x Nicky Davis x Martian Toys at either JPK’s DCon booth #709 or the Martian Toys DCon booth #1123 for $60.